Ahead of Student Race Day, which will be held on Friday (5 October) at Thoroughbred Park, I styled delightful ANU student Beth, and also had the pleasure of styling another ANU student, Kieren, who was also in need of some guidance for dressing for his very first Students Race Day. When dressing for the races, it is important for the guys to suit up! And think attention to detail. Traditional race wear for men is a suit, shirt and tie - that's right, no jeans in sight! Accessories such as a pocket square, lapel pins, suspenders and of course a hat should be incorporated, particularly if you are looking to enter in Fashions of the Field. 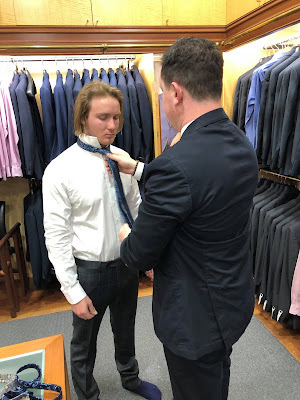 For Kieren's outfit, I headed straight to local menswear store Rodger Bartholomew for their expertise in fitting Kieren and to view their latest range of suiting for the new season. Store Manager Chris, fitted Kieren and recommended this charcoal with a blue checker three piece suit which he only just got in stock. The suit was slim fit which suited Kieren's frame but also gave it a modern and youthful look perfect for Students Race Day. I opted for a paisley blue tie to bring out the blue checkers and to add a pop of colour. Now, a hat is the preferred accessory for the races and is not complete without a flower. Thanks to Embassy Florist City Walk who customised this flower pin for Kieren's outfit. Now guys, if you are considering a flower pin and you want to impress the Fashions of the Fields judges, make sure you check the official flower of the race day you are attending. Don't forget, registrations for Students Race Day at Thoroughbred Park is from 12.30pm-2pm with the first heats from 3pm.